Design duo Chad and Courtney Ludeman have renovated a modernist residence in New Jersey, turning it into a rentable cabin that can act as a snug winter retreat. 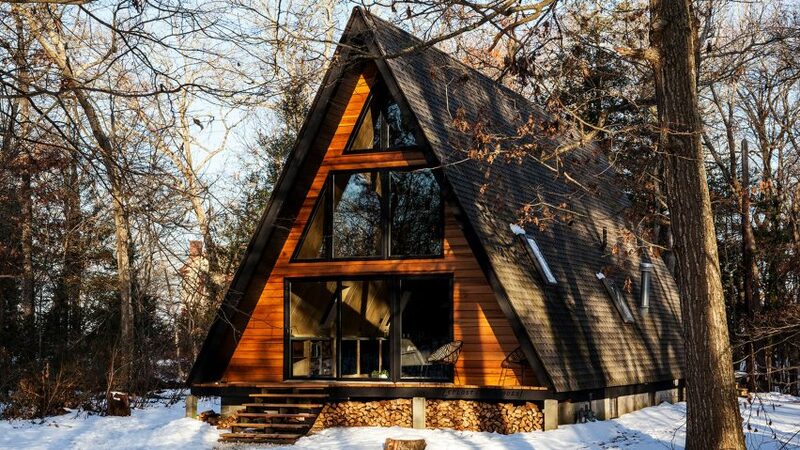 The 1960s A-frame residence was overhauled by the Ludeman's to serve as a private lodge and rural alternative to their Lokal Hotel in Philadelphia. Located in the woodlands of Dorchester along the Maurice River, about 50 minutes drive from the city and 20 minutes from nearby coastal towns, it can be used as an urban getaway in winter and summer. The cabin is situated on 2.5 acres (one hectare) of land and constructed from California Redwood. 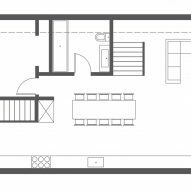 Comprising a double-height atrium, a lofted area upstairs and a basement below – all typical of the typology – the building sleeps eight people and can be booked on Airbnb. "We were fortunate enough to buy it from the original family that created it," said the Ludemans. "We completely overhauled it with a Scandinavian Modern interior design, and had it fully insulated with all mechanicals updated." A focal point of the interior is the sturdy materials used, such as plywood walls and concrete surfaces throughout. 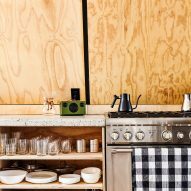 To highlight the home's original construction, existing beams are painted matte black to contrast with honey-toned plywood, with small gaps formed around each board. Pine plywood boards hide the new insulation that was installed. "We wanted to tear off the roof and insulate from the outside so we could leave the original beams inside, but the cost was prohibitive so we insulated from inside," said Chad. All of the concrete work was poured in-place by the designers. A concrete countertop spans 44 feet (13 metres) from the front door all the way to the back of the house, with black cabinets underneath. 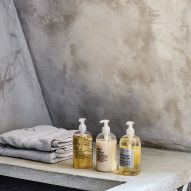 Other concrete details include bathroom vanities, shower walls and a Jacuzzi bathtub top. On the ground floor, a kitchen features a live edge wooden dining table that doubles as an island, created by New Jersey studio Timber Forge. Wide-plank white oak floors were completed by another local firm, Provenance Architecturals. A living room with a caramel leather L-shaped sofa anchors the atrium space. This and other furnishings were provided by Article. 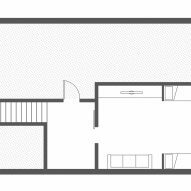 The large A-shaped gabled wall is almost entirely glazed, with patio doors leading to deck partially covered by the eaves. 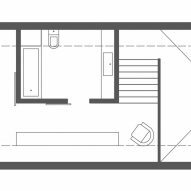 Completing the ground floor is a bedroom and bathroom, while another sleeping and wash area with a private terrace is found on the upper level. In the basement, four single beds are built bunk-style into the walls, and closed off from one another with curtains. A leafy floor design in the basement was painted by Philadelphia-based Sean Martorana. All matte black light fixtures were designed by Triple Seven Home. Also on the property are two fire pits, a rear deck, a wood-fired hot tub, and a waterfront area along the river. 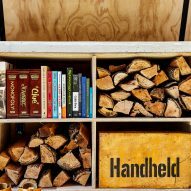 "We accumulated notes from what was lacking from every vacation home rental we'd been to in our lives," said Courtney. Photography is by Heidi's Bridge.